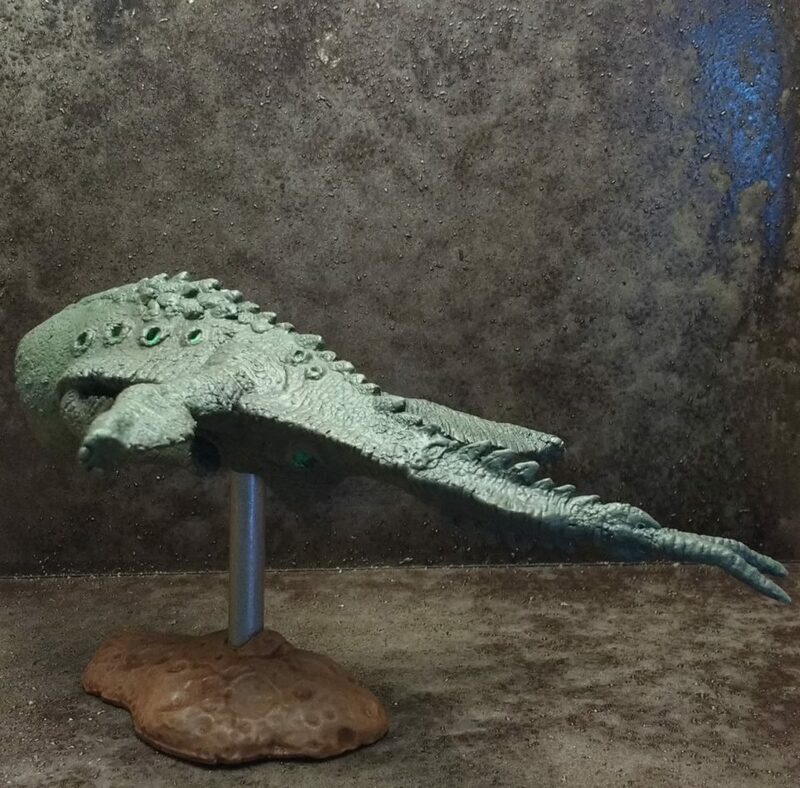 I ordered the Magellanic Nomad from Khurasan Miniatures immediately after reading a preview of the starship rules in Starfinder. Paizo will, eventually, get around to releasing space monster miniatures but even then I think this one will stand out. 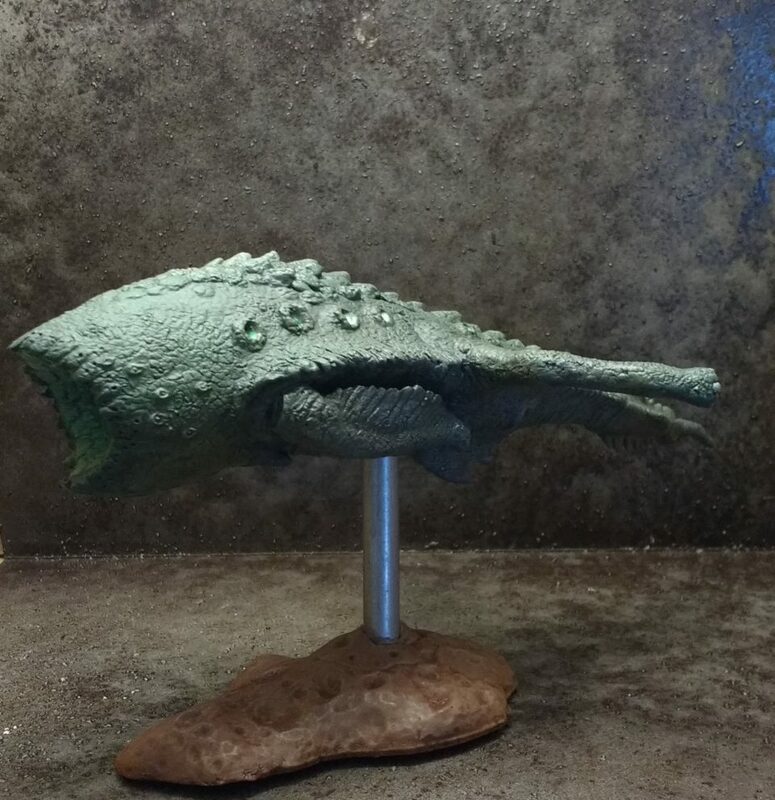 One great thing about this miniature’s design is that it isn’t pretentious; it feels natural, like a space whale, while evoking the menace of the Planet Killer from Star Trek the Original Series. The Magellanic Nomad isn’t putting on airs because it’s a space monster – it doesn’t care what you think, you’re just a tasty bite of plankton to it. It’s my intention to use it as something of a Space Tarrasque. It won’t be as prone to constant rampage as the terrestrial Tarrasque, most of the time the players will have to disturb it in order to get in trouble but it will occasionally go out of it’s way to snack on a starship if no mineral rich asteroids are nearby. This is, by far, the largest miniature that I’ve painted to date. I do have one miniature that’s larger, Kaladrax from the original Reaper Bones Kickstarter, but I have no plans to tackle that anytime soon. I scraped off the excess molding, assembled the beast, and primed it with Black Gesso. Then I started off with a neon green wash followed by many progressively lighter layers of gray tinted with green. I also gave it a few washes in a light neon green. Things were going smoothly until I tried to place the Magellanic Nomad on it’s pewter flight support… The flight support bent. I straightened it. It bent again. This was too stressful for me. I decided to scrap the pewter flight support and find something sturdier to take it’s place. I visited a local hardware store and found a few metal bits that had potential. It turns out that I only needed the first one. It wasn’t so bad drilling into the base but I was terrified when it came time to drill into the belly of the otherwise completed Magellanic Nomad. Would I ruin this beautiful miniature? Fortunately not! The new flight support is now in place without a hitch and is much stronger than the original. I noticed that the photos of my poor Werebear had some blurring so I put together a quick and dirty photo box for this one. Thank you, Khurasan Miniatures! The Magellanic Nomad is going to enrich my Starfinder games for years to come. I’m most often going to have it lingering in the background, a dangerous threat that the players can manipulate but not control. But I also like the idea of it being a dungeon – the players having to figure out how to get close enough to land so that they can proceed on foot looking for a rare mineral or the remains of a starship it ate.